Favourite genre of music: Anything but country! I will do a second blog post in the next week or so on what correlates I'm using to guide the lip reconstructions. 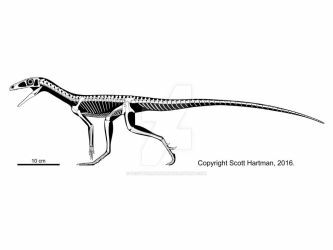 I also wanted to warn people that while I've updated around half of my theropod skeletals it will most likely be a few more weeks before I have those uploaded to DA, so in the meantime you are better off looking at the skeletal galleries on my website. I'll try to make time to get them here as soon as I can, but time will be tight for a while. 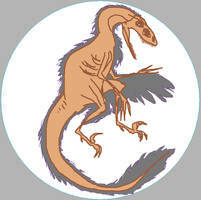 Deinonychus! 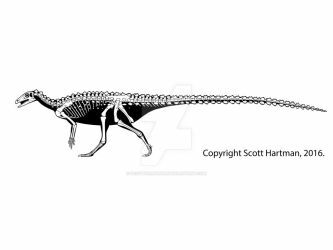 This was my favorite dinosaur in the 1990s (although I used the "Velociraptor antirrhopus" moniker that Greg Paul gave it at the time). Given the role Deinonychus played in sparking the Dinosaur Renaissance and inspiring the Jurassic Park book (and subsequent movies) it's an icon all its own. 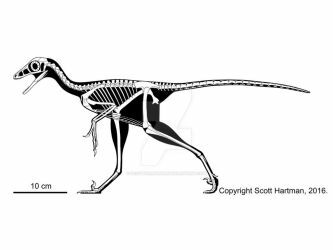 Edit February 2019: Just in time for the 50th anniversary of the naming of Deinonychus I give you a few more minor silhouette updates and... full lizard-style immobile lips. I've pretty much always supported this interpretation, but somehow convinced myself that they could be mobile enough (or the overbite was strong enough) that you didn't have to see the lip silhouettes in side view, so now I've fixed it. Anyhow, I imagine this might spark some discussion, so have at! 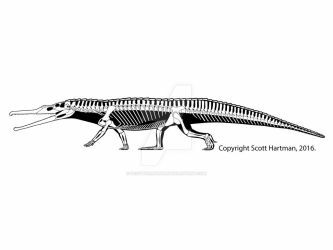 The strange european plant-eater Silesaurus. It was closely related to the origin of dinosaurs, but was not (quite) a dinosaur itself. 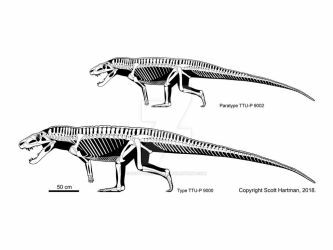 Recent discoveries are demonstrating that a large and bizzare array of archosaurs (the group that dinosaurs belong to) thrived before the dinosaurs came to dominate the land in the Late Triassic. 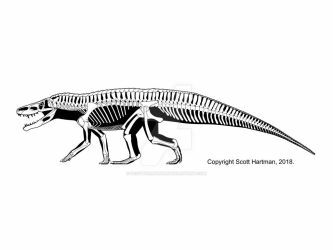 12/3/18 update: If you take my recent hadrosaur updates and insert the word "silesaur" for "hadrosaur" they also perfectly describe the fixes I've made here - less pronated hands and better placement of the pectoral girdle FTW. 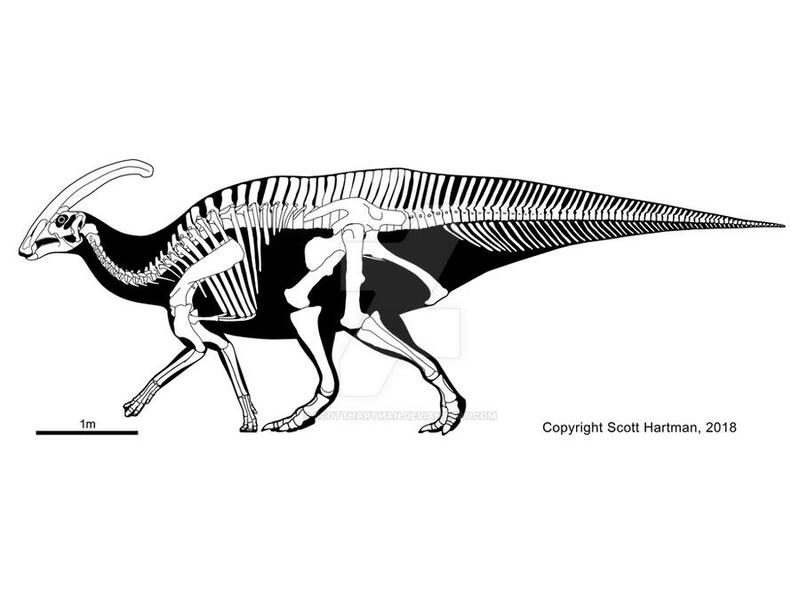 The more poorly known short-crested specimen of Parasaurolophus. There is still some debate as to whether it is a different species, or simply an immature individual (with the crest presumably growing later in life), or perhaps a female specimen. It's noteworthy that this specimen is actually larger than the specimens with long head crests. The better known species, P. walkeri. Some think that this and P. cyrtocristatus are the same species, although there are stratigraphic reasons to question this. 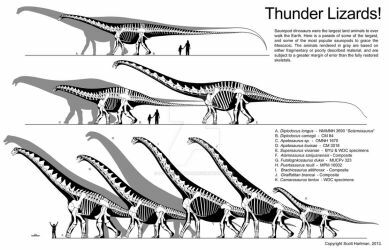 Edit: Most of my updates I'll let slide by without a notice, but there's a major shift in restored stance coming in hadrosaurs. 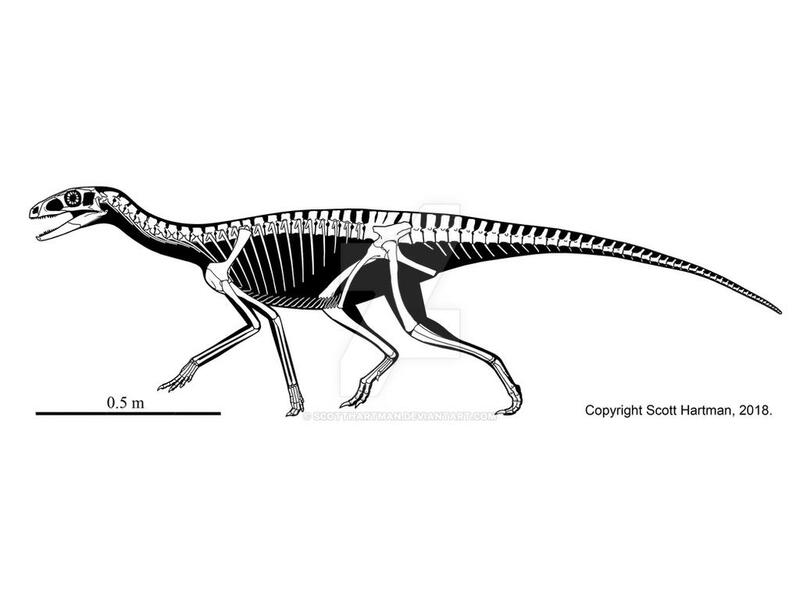 Research I've done (some of which I covered in my 2004 SVP talk) shows that the shoulder blades of hadrosaurs sit further down (and generally more horizontal) on the ribcage than they do in other dinosaurs. 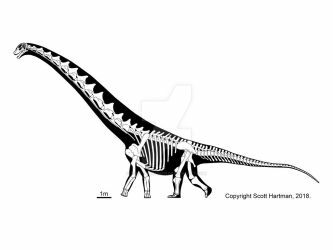 This has several cascading impacts on how the stance of hadrosaurs is restored, as well as the torso musculature. 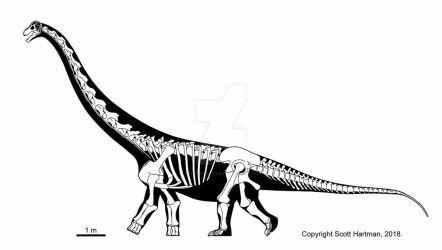 The short version (for now) is that duck-billed dinosaur tails do not stick up wildly into the air, as I and others had restored in the past. This also is important in terms of muscle leverage and efficiency during locomotion. 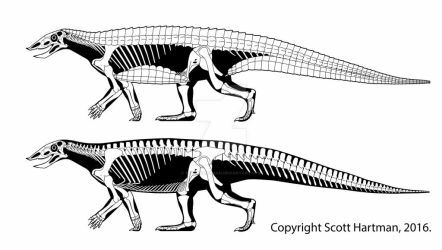 Edit 11/30/2018: More changes to the forelimbs, and some tweaking to the silhouette (this one had seen more updates than some of my other hadrosaurs, so there was less to do). would it be okay for you if I use some of your reconstructions as references for animation models while I credit you in the video description and leave a link to your page when I showcase them in Youtube? Hi Scott I updated my T.rex comparision with full credits on the image itself and in the description so if it Will spread on the Internet the Copyright Will still be there. How do you make these awesome skeletals if I may ask? That's potentially a really long answer, unless there's a specific aspect of the process you are interested in? The short version is I've studied comparative anatomy for years (I teach the subject now) including lots of dissections. 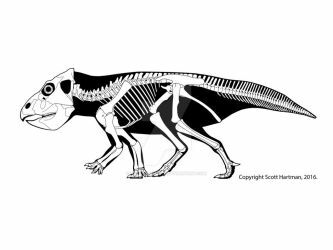 I also have been able to visit many of the fossil specimens I've restored (and I led a team that mounted about 20 of them in Thermopolis, Wyoming...putting them together in 3D really helped my 2d skeletals). Having been lucky enough to do those things, even when I'm working from photos and measurements I can generally visualize the bones three dimensionally. 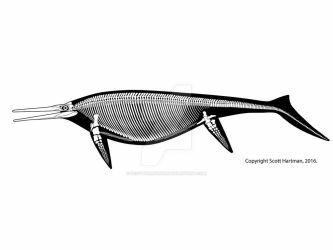 For a specific skeletal I generally start by (re)reading all the relevant scientific literature on that species, and often on close relatives (especially if I need to use them to fill in any missing parts). In terms of the illustration tools I use, I use Photoshop with many dozens of layers, illustrate each bone (I actually wrote a blog post that dealt with some of those challanges recently: www.skeletaldrawing.com/home/t… ). Once they are articulated I illustrate the silhouette on the bottom layer based on the most current analyses of soft-tissue reconstructions (well, the most recent ones I think are correct - like everyone else I have opinions and some of my own ongoing research that influences what I think). Keeping everything on layers like that at very high resolutions means chewing through more RAM, but it also makes it easier to repose and/or update them when necessary. I generally work on PCs desktops, because I can build my own to save money (especially when shoving 32-64 gb of ram into it). Last year I also started using a Surface Studio, which I've found helps shave a bit of time off the process of illustrating individual bones, which is nice, although I still work in my desktop for scaling, reposing, and often for the silhouette illustration. To facilitate that I've got everything synced through the cloud and I have a fast router and a nice mesh wifi system, so even with GB-sized files I rarely have to wait more than a few moments before I can switch between computers to work on the same file. I sort of condensed a lot of steps there, but I wasn't sure if you wanted a general overview or were looking for something specific. I hope it helps! Wow, thanks. It surprised me you actually draw each bone, I thought they were 3-d scanned or something. 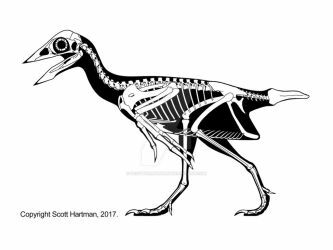 Inspired by your deinonychus skeletal, I'm going to try to turn this into a physical miniature sculpture. Sweet, I look forward to seeing that. Hey, so what species of Caiman is your Caiman skeletal?